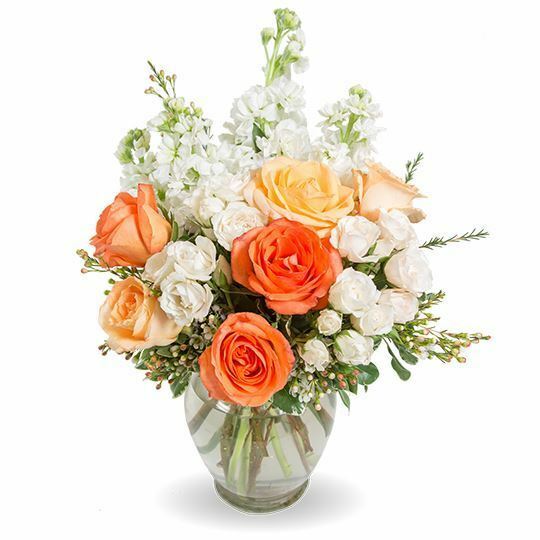 Brilliant pops of coral and orange roses are softened by delicate white flowers and greenery in this simple yet stunning arrangement. 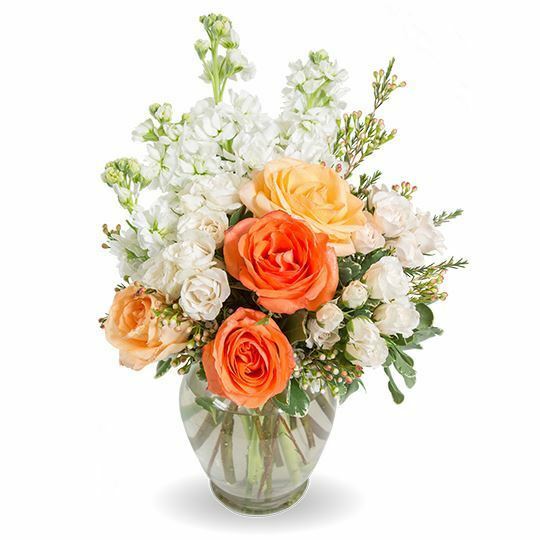 Whether to express condolences at a service or for delivery to the family, this versatile display will be admired by all. My cousin's family really liked the flowers! Thanks for making it so easy to send them! These are perfect! I got them for my friend who recently passed. Thank you! Very fresh and beautiful. Thank you for explaining the sizes and providing examples on your site, we went with the deluxe after comparing them all. Such a beautiful tribute!! I have never ordered flowers online, but was happy I did. I bought these for a dear friend. They were a perfect tribute for her! No complaints. They looked good and were delivered fresh! The family I sent these to said they looked lovely. Thanks! LOVED the peach roses. They not only looked great, but they were so fresh. You could smell them as soon as they were delivered. This is such a great idea. I'm still blown away at just how quickly they can hand make and deliver them! I didn't get to make the service so I sent these, and my sister said they looked great! These were so simple and elegant! Loved them. I'll need to remember to order flowers from here in the future because it was so easy to do! We have never ordered from here before, but sure glad we did! So beautiful!! I appreciate the quickness of the delivery, and how easy the whole ordering process was. Loved them!! Looked and smelled great!!! These looked and smelled amazing! 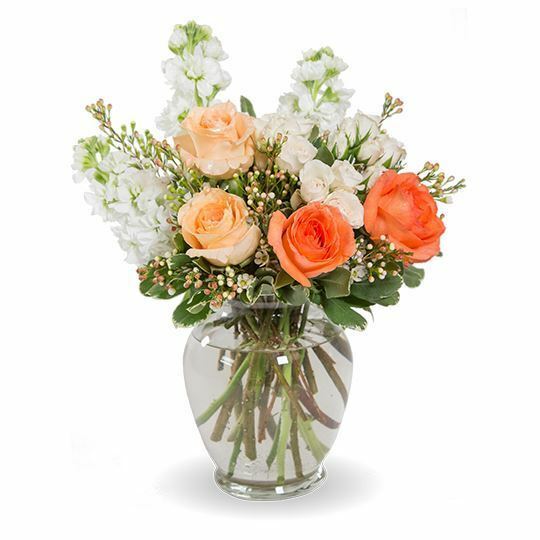 The flowers were phenomenal, and the quick delivery makes it worth every penny! Got these for my grandmother who recently passed, she would have really liked the different colored roses. They really stood out and I couldn't be happier! A perfect match of colors!! Simple process! Will order again, though I hope to not have to any time soon. I had to get these quick and they really delivered. Family said they were there on time and looked good! I really do believe flowers make a world of difference. These brought comfort to the room. Having flower orderin be such an easy process makes for one less thing to worry about! Really happy with how they turned out!